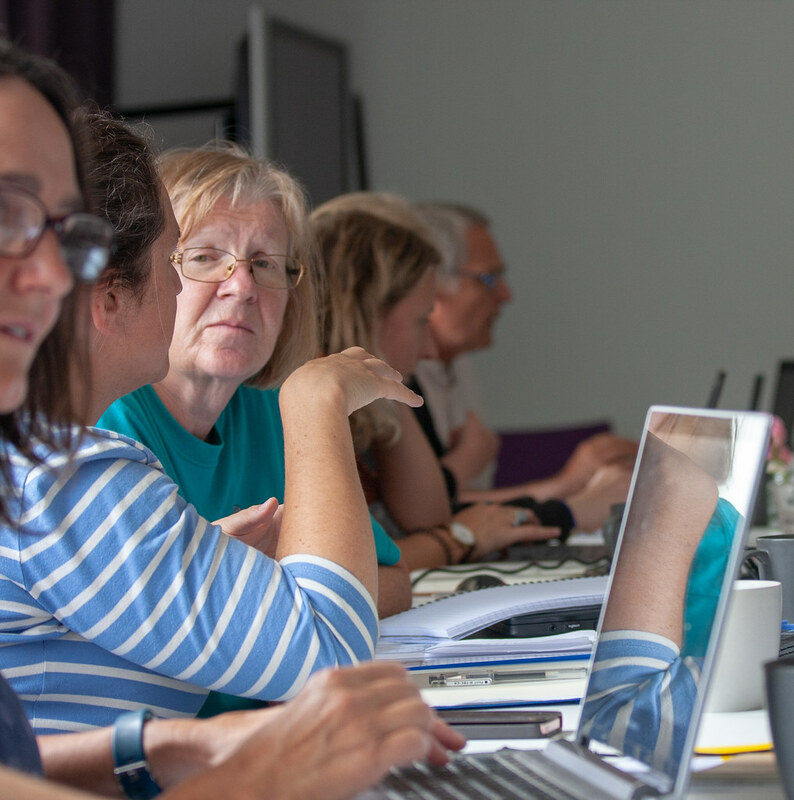 In July we ran an AccessLab in Penzance (UK), for people who work in marine and fishing sectors. This event was the first of three AccessLabs for 2018, funded by the Natural Environment Research Council (NERC) and in partnership with the British Science Association (BSA). This blog post is to document the format changes made, feedback received, and notes for future iterations. Photos from the event are available here and talk slides can be downloaded here. We were fully booked for the workshop, with local participants from marine conservation charities and volunteer groups, a marine development funding body, a marine governance organisation, a public aquarium, and a makerspace/training organisation – our researcher participants were all from the University of Exeter campuses in Cornwall with backgrounds in genetics, evolution, conservation, ecology, oceanography, microbiology, marine renewables and social sciences. As usual, we ran a preliminary training evening for the researchers, followed by a full day event for all participants. During the 2018 series of three workshops, we are laying the foundations for rolling out the workshop format further afield. For the Penzance event, FoAM delivered the bulk of the content to allow NERC and the BSA to primarily observe and understand the format. 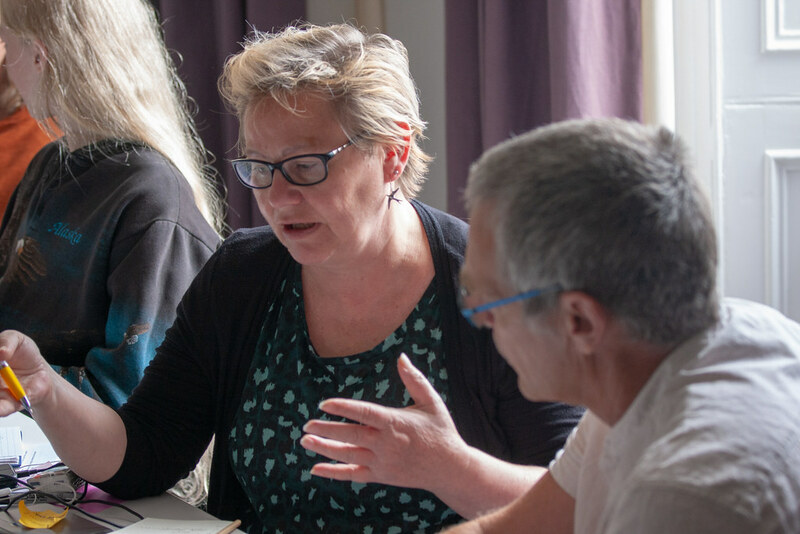 The next AccessLab, held in Exeter, will be delivered largely by the BSA – marking the first time the format will be run by someone who is part of FoAM. This means we will quickly learn where the snags are in the format. By the end of the 2018 series we’re aiming to have a honed format suitable for researchers to run themselves, without us needing to be present. - We provided everyone with a list of all the participants, together with brief descriptions of their interests, to read and refer to throughout the workshop. We asked participants at the start to make a note of contacts that might be useful to others, and made time at the end for these to be passed on. This seemed to be constructive and is easy to implement. - In the researcher-only training session, previously we asked people to think of all the different ways to access scientific research and how to judge its reliability, and then to vote on those that were the most useful. This time we asked the researchers to write these on separate pieces of paper and place them on a scale to indicate how easy these methods are to use if you have no background in research, and how reliable they are as an approach. We did this to encourage the researchers to begin to think about whether the methods they are familiar with are actually accessible to others without their acquired knowledge of the scientific research culture. This seems important as a component, but may need some modification for future sessions – we’d like to get it to the point where it doesn’t need outside intervention and can be led entirely by the researcher participants. - For the first time, two sections of the workshop were delivered by people other than FoAM. The BSA provided a talk on what a journal is/what peer review is, and NERC provided a talk on how science is funded. The funding talk was new, as in the pilot events many of the questions throughout the day have centred around how research is funded and how researchers decide what to work on. - The event was poorly timed for the marine/fishing audience as many potential participants were making the most of calm summer waters. We knew this was likely to be an issue, but it does serve to highlight the importance of getting the timing right for the audience. - Although we begin with a task that involves physical movement, much of the day is too stationary. We need to change some aspects to account for this. - At the end of the session fact checking media case studies, we had a round table discussion of what the participants had uncovered. This was too lengthy so we need to find a different way to gather people’s findings. One option might be putting a big poster up with the various stages of fact checking, and instead of a discussion, ask participants to add any detail to the fact checking list that they want. This would result in a centralised resource with more ideas, and would have the secondary benefit of getting people physically moving again. - There are some problems with the format for the researchers, as many are already familiar with content that is essential for the other participants, and also because the two-day format necessitates some repetition. One possibility is to return to our previous approach where instead of talks on how publishing works and how research is funded, we run co-creation sessions where the researchers work together with the other participants to generate this information. Additionally, currently we do two sessions looking at the sources of information each participant group uses for different types of questions – there may be a more clever way of doing this so that everything needed can be covered in a single session. Another option might be to provide the talks as videos for the participants who aren’t researchers to watch before coming, but this also has drawbacks. - One of the biggest changes we want to make is to reduce the length of an AccessLab workshop to one day instead of two separate events - to allow a greater diversity of people to attend. With this in mind, we used the Penzance event to gather feedback from participants on which components of the workshops were essential and which we might be able to drop. - For the preparatory session just for researchers, the exercise rated as most useful was on where to find sources of scientific information/how to judge the relability of a piece of research, with 7/8 rating it fairly or very important – this should be retained in some form without doubt. However, 5/8 rated the EU info source exercise as fairly or very important, and 6/8 ranked the exercise on finding papers for the big questions as fairly/very important, so it's not necessarily sensible to drop these. Our researchers were at very different stages of their careers (early PhD to tenured lecturers), so some aspects may be more useful to those with less experience. - All components were overwhelmingly voted as fairly or very important by the marine-sector participants (with only two exceptions amongst the 70 responses - one person marked the sources of information exercise as neutral and another person marked the funding talk as neutral). This suggests we have the format well developed for this group and we may not be able to shorten the day considerably without compromising quality. - The researchers tended to rank the talks (about the AccessLab project, journals/peer review, funding, and media case study) as being less important for them – we believe this is because they are already familiar with some of the content. - In the marine/fishing sector group, for confidence researching scientific questions, 2 went up by 2 levels, 5 went up 1 level, and one went up half a level. For confidence working with people who weren't their normal peer group, 4 went up by 2 levels, 3 went up by 1 level, and one reported no change. This indicates that we are meeting the primary aim of the AccessLab project well. - Unsurprisingly, no researchers reported a chance in confidence in researching scientific questions, 4 researchers moved up one level in their confidence working with people who weren't their normal peer group, 3 reported no change, and 1 went down a level (further explanation would be very useful here so in future we may include a specific free-text area to add optional information). For future workshops it would be worth adding a feedback question for the researcher group on their attitudes to open access before and after the workshops. Free text feedback indicated that the main outcomes for the researcher group were widened local networks, an improved understanding of how people outside academia want to use research, and better awareness of the problems caused by paywalls. The free text feedback from the marine/fishing sector participants indicated that their main outcomes were how to find and quickly access sources of reliable information, and how to assess evidence. Through developing these events from the very first explorative pilot in 2015, we have reached a point where we are largely happy with the format. Since the content now works well, we can change our focus to making it easier for others to run, and begin to develop full documentation on how to run an AccessLab. To decentralise research skills so a broader range of people are able to access/use research, reducing inequality. To expose researchers to the difficulties of using their research as an outsider, creating new open access advocates. - One marine/fishing participant has applied for funding and is now building a collaboration with their paired researcher to look at the question they brought to AccessLab in more detail. - Another marine/participant is working on a new question with a sixth form student on a Nuffield placement at the European Centre for Environment and Human Health after making the contact at AccessLab. - A group of three marine/fishing participants have formed a working collaboration with one of the researcher participants to publish some of their charity's research findings. - One of the marine/fishing participants used their session to evaluate evidence for an environmental legal matter. 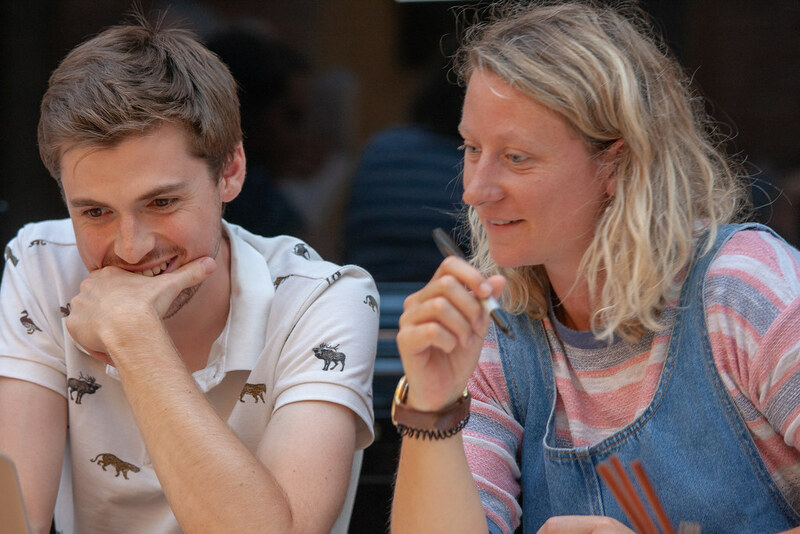 Thanks to FEAST Cornwall for funding for the first AccessLab pilot, the British Science Association for funding the second pilot, NERC for funding the 2018 series, and of course all our participants for their feedback and advice throughout and to the fabulous Hoon Kim from Sohn Kitchen for keeping everyone happily fed.